The MJT2015 Card/Board Game Jam is underway! If you want to see previous posts about this jam, go to the Previous Jams menu at the top of the site, or follow this link. Again, you can have a look at the paper prototyping post to see what you could expect when creating a paper/cardboard prototype. And we also posted generally good advice on creating your card/board game prototype in another post. 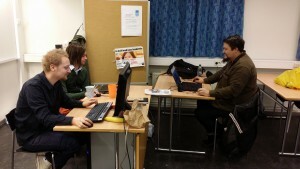 The Facebook event (and e-mail) are places you can reach Jeff, Samanta or Torsten. We will otherwise definitely be at the jam according to the schedule. It’s never too late to register for the jam. 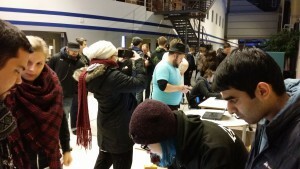 You will have to still use the registration form and then find one of the game jam coordinators to help check you in. Frej R. Alrik H. Björn O.
Rasmus Ö. David R. Rauli S.
Sofia P. Linnea M. Martin W.
Jaffar S. Eric L. Marie B.
Samanta M. David A. Dennis J.
Torsten H. Gustaf A. Luka L.
If anyone was wondering how to use anydice.com, here’s a quick way to see roll distribution. Let’s say you have 3 dice which have 6 sides, and 2 dice which have 20 sides. And you want to see what the roll distribution is if you roll them together. 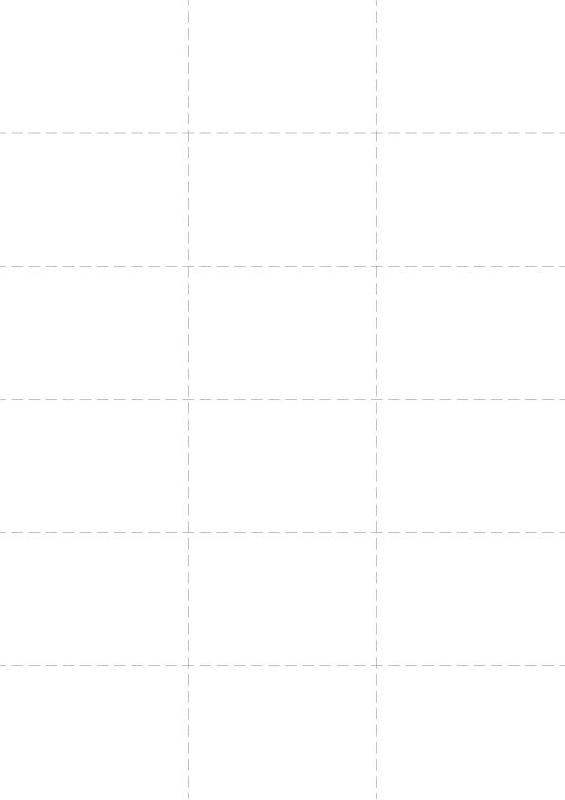 You would write “output 3d6 + 2d20”. Notice here the first number means how many dice, the d just stands for dice, and the last number is how many sides the dice has. So 5 dice with 24 sides will be written as 5d24. The printer installs any needed drivers once you hook it up to a laptop. It’s pretty neat! Speaking of the printer! 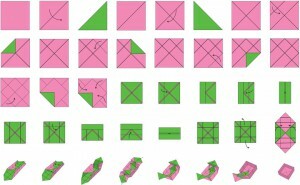 You may use this handy card sheet to divide an A4 into small cards. 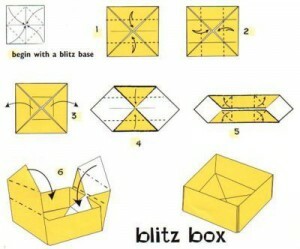 You may also follow these instructions in creating an origami box (they all create the same type of box). – A rules/instructions sheet (+diagrams). See our prototyping advice post for help with that. – Any assembly instructions and templates as needed. – Action shots of the game being played (photos). – A gameplay video explaining how the game is played. This is optional but also seriously helps. As with all game jams, remember to embrace constraints and to focus on core game mechanics. It’s about time! 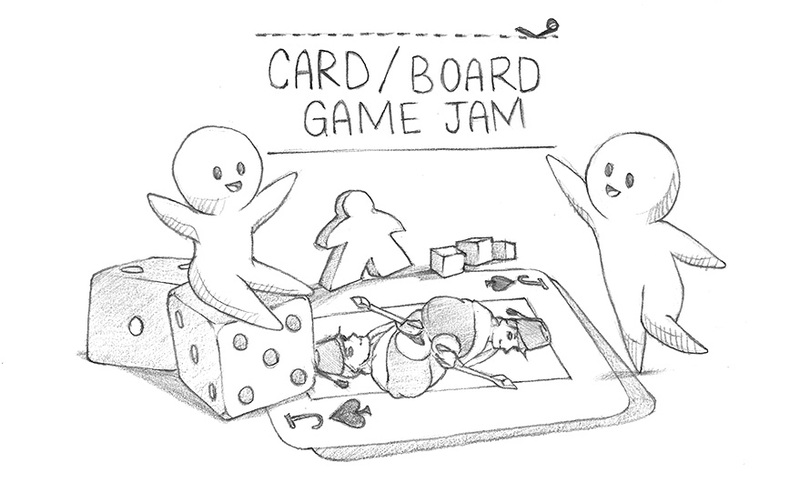 We’re excited to host another game jam, this time revolving around the creation of physical games. As usual, we will reveal the theme right before the jam. We’ll also update concerning what materials you will need for the jam. You can have a looksie at the paper prototyping post to see what you could expect when creating a paper/cardboard prototype. We’ll bring some of the tools/materials, and will give you details on what you will need to be comfortable in good time before the jam happens. Spots will be limited, but not too limited! We will announce updates here and via the Facebook event (and by e-mail to a few of you). Be sure to register using the registration form to guarantee a spot. *Anything that involves screens that generate computer graphics will not count towards this jam unfortunately. Simple electronic dice and timers/counters will not either. 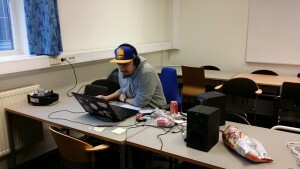 Thanks for a fantastic GGJ15! We have gotten a lot bigger since last year, and still had a great time! 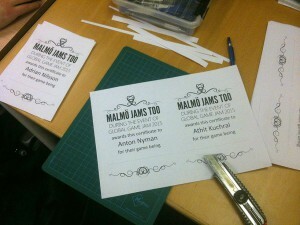 What follows is a postmortem of the jam experience from our side. 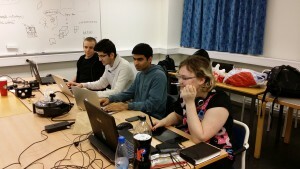 The games for this year can be found at http://globalgamejam.org/2015/jam-sites/malmö-university/games (you can also see 2014 entries by changing the year in the link). Since last year, we planned to start a month earlier in planning. But apparently planning in November really was not as optimal as we thought (partially because there’s quite a few birthdays to celebrate that month). It’s not easy to plan an event when cake is on the line. 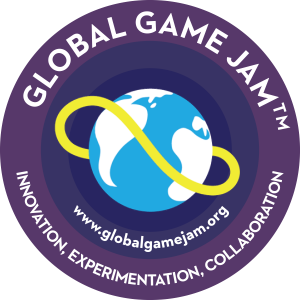 So if we will organize next year’s event, we will start planning October, which coincidentally is when sites can begin registering on the GGJ website. This allows us to plan for workshops and perhaps even get sponsors leading up to the event. One thing we did release before the event was a Paper Prototyping post which hopefully inspired some of you to check out what it means to rapidly prototype on paper, and a printable PDF checklist which we hope was somewhat helpful. We did not really get feedback on these things, but these still make great resources for future use. Since we didn’t have a speaker this year, we decided to hold the presentation before the keynote. It got a lot of practical stuff out of the way too, and we included tips for first timers as well (thanks to Sabrina from pigda/Pittsburgh for the presentation which helped fuel that). It’s also our first time declaring that no one leaves the room until everyone has a group. I think that went over well and things worked out in the end. 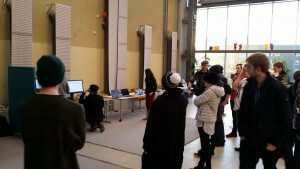 Instead of presentations at the end we did a game show this year, an exhibit-style show which allowed you guys to play the games you made. We totally prefer this over presentations. From our experience presentations are very tiresome at the end of an event and a mostly sleepless weekend. The time it takes to present is multiplied by the amount of games, and that makes even us grumble. Plus you get to show off what you spent 48 hours making, that’s seriously a fantastic feeling. Instead of making the event too much about competition, we opted to give everyone a personalized certificate with their own award. We did not expect that it would be so stressful to write in the award titles in such a short time, but luckily we gave out certificates to every team with a game but a certain team of three, who left early unfortunately. There’s an infographic below which shows which award each team got. We had fun making up award names on the spot. One other thing we did was hand out roles at check-in, which we hoped would speed up the group forming process after the theme reveal. For organizing most of the event we used a lot of Google Drive stuff. From presentations, to registration forms, to keeping track of registrations, e-mails, to-dos, even a timeline of what kind of responses we were giving out and how! It was really ideal. So we’ll keep using that in future. 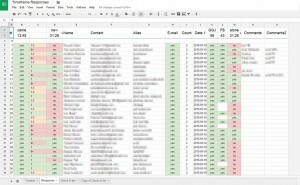 We sent out a total of 5-7 e-mails this event/user, which was totally under the expected limit of 10-15 (we’re happy about that). We also noted that you were comfortable in your rooms and really got into the spirit of jamming. We should probably have taken way more photos of you getting into your element, but we at least got some sweet action shots! Anyways, you may see how the Hello video for 2016 looks here http://malmojamstoo.com/files/MalmoSweden_GGJHello2016.mp4, which is a happy first for us. If you are interested in future game jams we are hosting or other related workshops from MalmöJamsToo, you may choose to subscribe to us by contacting our e-mail with the subject “subscribe” (we promise to only inform you of events/workshops only!). Below is a fancypants infographic about how our GGJ2015 event went. We’re underway with the GGJ2015! Registration is now closed, although students of Malmö University may request to join the registration list manually by contacting the organizers. The theme and keynote are no longer secret as well. First you would read the Rules and Guidelines we set out. 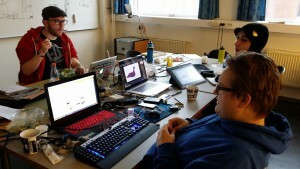 Then create a profile on globalgamejam.org‘s website if you do not already have one (if you are not sure don’t worry, we’ve linked it in the Registration). Next, you would fill out the Registration form. We’ll add you to a mailing list which will only be active during the GGJ 2015 event, and you’ll receive a positive confirmation e-mail that you have successfully registeredÂ (This may take a few days). Registrations close up until Wednesday, 21st of January. This is a preliminary date right now but we definitely would not be accepting registrations later than that. 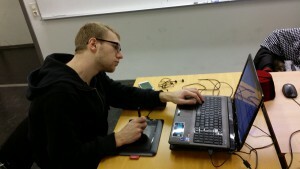 Thanks for a great GGJ14 everyone! Thanks to all the participants, and also those of you who made this possible. 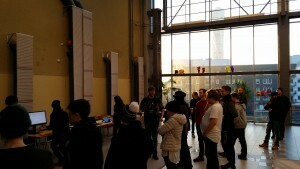 Some of you never been to a game jam, and we hope this will be one of many for the next ones to come. We might poke some of you on your game pages about the format or missing jammers. Thanks again, and we wish you all a great week ahead! 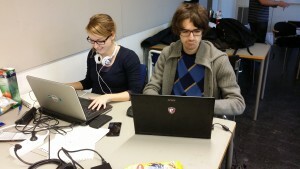 Jammers, you have a Saturday Jan 25th 11:00 deadline to create an user profile and game page. Here is a link to the Game Upload manual to help you out. The Resources and Contact page have been updated with more links and hashtags and even an IRC chat for GGJers the world over. GGJ Radio is Live, and you can listen in through this stream. If you need help with making a gameplay video, here’s some options. 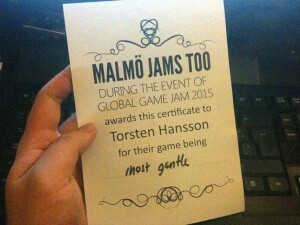 Malmö Jams Too with the Global Game Jam 2014! 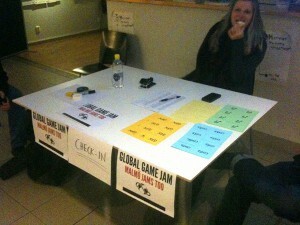 Then create a profile on globalgamejam.org’s website if you do not already have one (if you are not sure don’t worry, we’ve linked it in the Registration). We’ll add you to a mailing list which will only be active during the GGJ 2014 event, and you’ll receive a positive confirmation e-mail that you have successfully registered within a few hours-days. Registrations close up until Wednesday, 22nd of January. This is a preliminary date right now but we definitely would not be accepting registrations later than that.